On March 11, 2009, BCL attacked a rally organized on the occasion of Shaheed Day in Rajshahi University campus. On March 12, the university proctor, led by the student advisors, arrested hundreds of Shibir leaders and activists after raiding all the halls and universities surrounding the university. With the help of external terrorists and police administration on 13 March, BCL blocked several gates and gave a series of threats of torture and killing of 8 people, including organizing secretary of Shibir University branch. When the organizing secretary of Rajshahi university Farhad Alam, including 11 other students were kepy hostage and tortured by BCL in Sher-i-Bangla Hall of RU, police and administration did not help in their evacuation. Shaheed Nomani tried to save his brothers at 11:30 in the night with the help of the police, but he was caught by BCL terrorists, attacked mercilessly and his head was split open with sharp weapons, whereby he passed away from the fatal wounds inflicted upon him. He was martyred on the way to hospital. 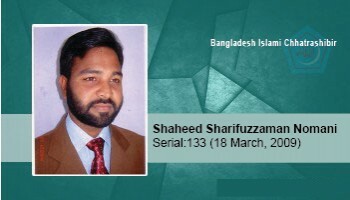 Shaheed Sharifuzzaman Nomani was the secretary of Rajshahi University branch.